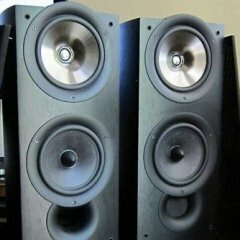 Hi, I'm thinking of buying a pair of Reference II R-28F. Would the Onkyo TX8150 be a good match for these speakers? I'm not interested in 5.1 or anything like that. And what exactly is underpowering? Do I run a risk if I would use speakers at a low volume? I believe you're referring to the Reference R-28F, as Reference II is now referred to as Reference Premier. For 2 channel listening, I'd personally suggest looking at the RP-160M with that receiver. The 160M is a fantasy bookshelf speaker made with better quality parts and performs wonderfully. They should also pound the R-28F's into the ground. Don't worry too much about underpowering - as Klipsch speakers can thrive on as little as 1 watt. I agree. Since you haven't bought the speakers yet, redirect your aim at some real Reference stuff. If you want new towers, try to get some clearance RF-82ii towers before they're gone. If you're good with bookshelf models, go for the RP-160M. If you're okay with used, like me, you can check your local Craigslist for older Reference towers such as RF-3 or RF-35. And, no, you don't need to worry about underpowering your speakers with that Onkyo. My eye fell on the R-28F because they were perfect for my price range and I read some good reviews. But I also read they are not the best. How would you compare the RP-260F to the R-28F? The 260 would run circles around the 28 any day of the week. So I guess it's gonna be the 260 then. One final question, Is it still the case that you can blow your speakers by switching on the amplifier when volume is not at zero, or are modern amplifiers protected? thanks! Most modern amplifiers won't have that issue. I have never had my amps set to 0 to turn them off and on. What integrated amp, receiver, or preamp/amp combo did you decide on? I recently got a pair of R-28F speakers for my mains/fronts, and currently have a decent Polk 12" sub. and I'm finding out that my 10+ years old Onkyo HT-R510 AV receiver don't sound so good, the sound quality is just not there (maybe because it's older, lacking modern circuitry etc.). Seems like I need additional EQ to bring out the highs, etc. I know there is nothing wrong with the speakers, they are brand new. So, my surround/music system build is a work in progress, and I think my next purchase will need to be a new current bad *** AVR. Can anyone chime in with recommendations on a good AVR (with at least 100+ watts/channel) that would make my R-28Fs sing??? You will get more help if you start your own thread. What are your goals, HT, music, or both? Is the room upstairs or in a basement? How large is the room and how far are you from the speakers? Is this a 2 ch, 5.1 7.1 or possible Atmos system? All these thing will guide recommendation. Welcome to the forum Purerock Racing.